– What is always and already present within every moment of existence? Adyashanti guides you to explore the awareness that is there before you even try to be aware. By switching your focus from the content to the context of your experience, a vast open spaciousness is revealed to you. Guided Meditation – Although the content of our experience is always changing, we see that ‘experiencing’ is the common factor in all experiences. It is thought that divides experiencing into a subject and object. In the yoga meditation, images of fire and music are used to bring us experientially to this understanding. In this interview which is the second conscious.tv one with her Linda says that enlightenment is the beginning of a whole new way of living and although its the end of suffering and fear, there is no end to the practice as long as one is in the body. To be fully free you need to go through being grounded, so grounded that you’re able to let go of everything—even enlightenment. Stay in your body. The silence is in your body. Its not out there. Stay in your body and you’ll be surprised what happens. To really become immersed in the silence, you need to free your body – purify your body of the past. Only then will there be silence and that silence is overwhelming. A participant asks Rupert how mantra meditation fits in with the non-dual understanding. The author’s first book, India Mirror of Truth, was a popular memoir about his time in India. Govindas father, ruler of a small fortress kingdom at the edge of the Great Indian Desert, leads his men in a desperate attack against the besieging forces of the imperial army. Upon receiving word of his fathers death, Govinda is to lead his people into the sacrificial fire to avoid being ravaged by their cruel conquerors. However, Govinda has a plan. When Govindas plan goes awry, the emperor imprisons his mother in the palace harem, and the crown prince is forced to flee to Tibet with a caravan of lamas. At the foot of Tibets most sacred mountain, Govinda meets a Himalayan yogi who adopts him as a son. With the help of the enigmatic Shankar Baba, Govinda begins to unravel the mysteries of his soul, discovering a past extending beyond this life and a future promising a noble partner who helps him restore the throne to its rightful heir. As the seasons pass, Shankar Baba initiates Govinda into the secrets of enlightenment and immortality while preparing him to confront the imperial army, sinister forces controlling the throne, and a tantric sorcerer who seeks to discredit his guru. But no amount of training can prepare Govinda for what awaits him. As a teenager, Steve Briggs met his guru at a meditation retreat in the Swiss Alps. 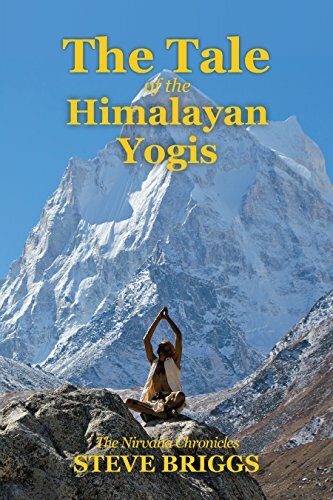 After studying English Literature at the University of Arizona on an athletic scholarship, the author received a Ph.D. in Vedic Studies and traveled internationally instructing thousands in the art of meditation. Sent to India by his guru, the author embarked on a seven-year odyssey taking him from Cape Comorin in the south to the high Tibetan plateau. Along the way, he initiated Indias government and corporate leaders into meditation, encountered saints and sadhus, and astrologers and artists. He sipped yak butter tea with lamas at windswept Tibetan monasteries and hiked the paths of Vedic Indias time-honored pilgrimages. As the guest of a Maharaja, he shared the fervor of thirty-million pilgrims at the Maha Kumbha Mela, the worlds largest religious festival. The authors first book, India: Mirror of Truth, A Seven Year Pilgrimage, was a popular memoir about his time in India. Steve is now working on the second book of The Nirvana Chronicles. Deepak Chopra chats with Jimmy about the importance of difficult and polarizing moments in history, and he offers some ideas and a book recommendation to heal a “wounded” President Trump. Deepak Chopra guides Jimmy, The Roots and the Tonight Show audience through a two-minute meditation. Dean Sluyter (pronounced er”) has taught natural methods of meditation and awakening since 1970. His five highly acclaimed books include Natural Meditation: A Guide to Effortless Meditative Practice (Amazon #1 stress management bestseller, and Nautilus Gold Medal winner for best mind-body-spirit book) and Fear Less: Living Beyond Fear, Anxiety, Anger, and Addiction. Dean gives talks, workshops, and retreats throughout the United States and beyond, from Ivy League colleges to maximum-security prisons. His media appearances have included National Public Radio, The New York Times, New York Magazine, Coast to Coast AM, The Dr. Oz Show, and O, The Oprah Magazine. Marjorie Hines Woollacott, PhD, has been a neuroscience professor at the University of Oregon for more than three decades and a meditator for almost four. Her research has been funded by the National Institutes of Health and the National Science Foundation for 35 years, she has coauthored a popular textbook for health professionals that is in its 5th edition, and has written more than 180 peer-reviewed research articles—several of which were on meditation, the topic that motivated her to write the book Infinite Awareness: The Awakening of a Scientific Mind. As a neuroscientist, Marjorie Woollacott had no doubts that the brain was a purely physical entity controlled by chemicals and electrical pulses. When she experimented with meditation for the first time, however, her entire world changed. Woollacott’s journey through years of meditation has made her question the reality she built her career upon and has forced her to ask what human consciousness really is. Infinite Awareness (winner of the 2017 Parapsychological Association Book Award, Eric Hoffer Book Award and the Nautilus Book Award) pairs Woollacott’s research as a neuroscientist with her self-revelations about the mind’s spiritual power. Between the scientific and spiritual worlds, she breaks open the definition of human consciousness to investigate the existence of a non-physical and infinitely powerful mind. He has been a Buddhist practitioner for over 40 years. In the 70’s he read ‘Three Pillars Of Zen’ which started him on his path of meditation and then a few years later he had a significant awakening experience which showed him the nature of reality. He discovered the Jhana path of meditation and found he strongly connected with that. Tina teaches Jhana Meditation and helps students recognise their deeper nature, both on the cushion and in daily life. She wrote the book “Practicing the Jhanas” with her teaching partner Stephen Snyder. She also worked as an organisation development consultant and coach for more the 25 years and published several books on humanistic business practices. Tina learned to meditate at age 13 and had been attending long silent meditation retreats. For years she practiced in Buddhist and Non-Dual traditions. She had a natural talent for concentration meditation and undertook an intensive year-long solo retreat during which a profound awakening to true nature occurred. After life-changing experiences Tina felt the strong pull to become a “cave yogi” but as the awakening matured, it was compelling to her to function in the world from an awakened perspective. Bob Roth is one of the most experienced and sought-after meditation teachers in America. Over the past 40 years, Bob has taught Transcendental Meditation to many thousands of people and authored an authoritative book on the subject, fittingly entitled, Transcendental Meditation, which has been translated into 20 languages. Bob currently serves as the CEO of the David Lynch Foundation, a 501(c)(3) charity which has brought meditation to over 500,000 inner-city youth in underserved schools in 35 countries, to veterans and their families who suffer from post-traumatic stress, and women and children who are survivors of domestic violence. Bob also directs the Center for Leadership Performance, another nonprofit, which is bringing meditation to Fortune 100 companies, government organizations, and nonprofit charities. Bob is the host of the SiriusXM radio show, “Success Without Stress” and has spoken about meditation to industry leaders at such gatherings as Google Zeitgeist, Aspen Ideas Festival, Wisdom2.0, and Summit. Every day we face a growing epidemic of stress that is damaging to our physical and emotional health. While there is no one single cure, a simple practice dramatically changes how we respond to stress and life’s challenges: the Transcendental Meditation technique. 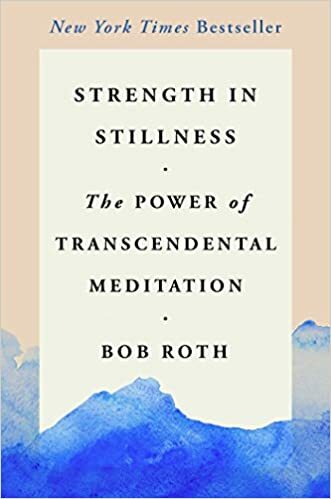 Bob Roth, a world authority on Transcendental Meditation for forty-five years, joins us to present wisdom from his book Strength In Stillness: The Power of Transcendental Meditation. He is joined onstage by Oscar-nominated filmmaker David Lynch, founder of the David Lynch Foundation for Consciousness-Based Education and World Peace. Together they outline meditation’s scientifically proven benefits—improved focus, sleep, resilience, creativity, and memory to name a few—and demonstrate how this five-thousand-year-old technique can have a clear and direct impact on our very modern problems. They highlight the three distinct types of meditation—focused attention, open monitoring, and self-transcending—and showcase the evidence that the third, Transcendental Meditation, is the most effective and efficient way to reduce stress, access inner power, and build resilience. Join Roth and Lynch for a simple, practical, and straightforward guide to the healing and stress-reducing potential of Transcendental Meditation. 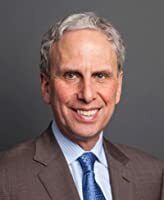 Bob Roth is one of the most experienced and sought-after meditation teachers in the world, with 45 years experience teaching Transcendental Meditation to billionaire CEOs, Hollywood celebrities, combat-scarred veterans, and inner-city youth. He currently serves as the CEO of the David Lynch Foundation, and also directs the Center for Leadership Performance. Bob is the host of the SiriusXM radio show, Success Without Stress, and speaks frequently about the science of meditation to industry leaders at such gatherings as Google Zeitgeist, Aspen Ideas Festival, Wisdom2.0, and Summit. Three-time Oscar-nominated director David Lynch is among the leading filmmakers of our era. From the early seventies to the present day, Lynch’s popular and critically acclaimed film projects, which include Eraserhead, The Elephant Man, Wild at Heart, Blue Velvet, Mulholland Drive, INLAND EMPIRE, and Twin Peaks are internationally considered to have broken down the wall between art-house cinema and Hollywood moviemaking. He is founder and chairman of the Board of Trustees of the David Lynch Foundation for Consciousness-Based Education and World Peace. A person comes in the universe to do three jobs—karma, dharma, and meditation. These three contain the entire philosophy of living. Karma is to take action for earning money, producing children, and bringing them up while living in the universe; dharma is to do this action as per tenets of one’s dharma; and meditation is to surrender all of one’s doing to God. However, he gets absorbed in earning money and producing and bringing up children. He remembers little or nothing of dharma and completely ignores meditation. This book, which is based on vast knowledge of Vedas and Shastras and over seventy years of experience of meditation, is the answer to the fulfillment of one’s jobs (mentioned above). The author has made these very easy to follow and intelligible, and it is hoped the book would be of help to readers in achieving the goal of karma, dharma, and meditation, which gives mental relief. Hailing from Haryana, the author Mr D.D Aggarwal was born in 1933. He did his schooling from Sonepat and had further education from Delhi. Having been recruited through IAS & Allied Services examination, he retired as Joint Secretary from Ministry of Railways in 1994. After retirement he started writing books as pastime and has already written many books including: • Protocol in Ramcharitmanas (in English and Hindi) • Protocol in Srimad Bhagwat (in English and Hindi) • Protocol in Mahabharata (in English and Hindi) • Upanishadas – The Real Truth • India Ever Independent:- Why Only Fifty Years • Judisprudence in India Through Ages • State and District Administration in India • Bharat Mein Shaashan Pranali (in Hindi) • CBI and Policing in India (in English and Hindi) The present book, Karma, Dharma and Meditation is the latest addition in the series. Of late he has started writing poems in Hindi and has a collection of over 2000 poems, mostly on spiritualism. In my youthful naivety, I also began what I deduced as a meditation practice from stories in the book. This practice was quite complex and involved sitting quietly in the lotus posture with my spine perfectly straight while emptying my mind of everything. After about four years of practicing my meditation, one day I was sitting quietly and deep into it, when the bottom dropped out. No mind, no thought—just a great expanse. When the experience ended, I felt the most amazing deep sense of happiness bliss. This bliss we might describe as “the peace which passeth understanding”. After many years of practice, I had a classical awakening into higher consciousness. Now living in non-duality or as Maharishi described it “living 200%, the fullness of the absolute and the relative lived completely and utterly together.